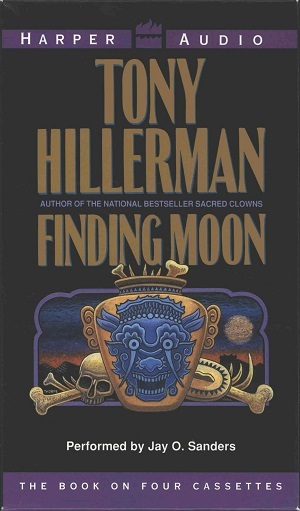 This is the first audio cassette book of Finding Moon, which was published in 1995 by HarperCollins Publishers in New York City, New York. There are four cassettes and each side of the cassettes runs about 45 minutes (360 minutes total or 6 hours of tape). This audio book version was read by Jay O. Sanders. The audiobook has been recorded onto four audio cassettes and includes a cardboard case with a full-color cover design. This cover design is the same as Peter Thorpe's cover from the first edition of Finding Moon. The only difference is the addition of the publisher's name, the number of cassettes, and the reader's name. Format: Audiobook, 17.7 x 10.5 cm.